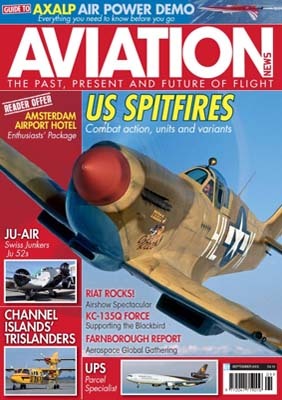 Philip Stevens reports for Aviation News. 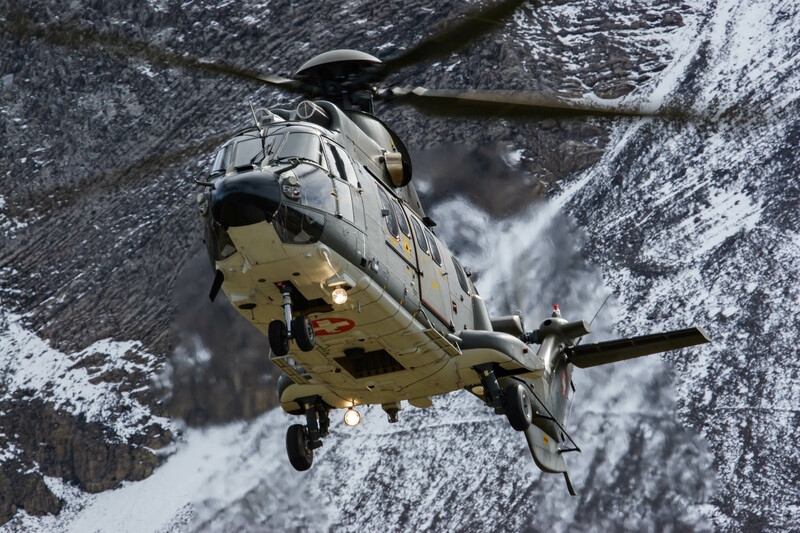 The Swiss Air Force's Axalp Air Power Demonstration held annually, is not just an air show it is an experience. 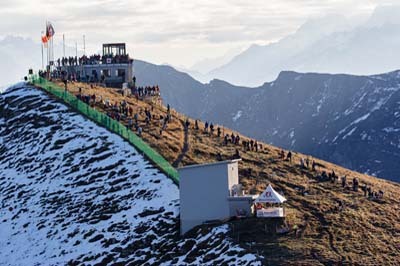 The Ebenfluh firing range is found near the summit of the 7,614 feet (2,321m) high Axalphorn mountain in central Switzerland. You have to work pretty hard to get your photographs here. First there is the climb up, more on that later; secondly the shooting conditions are challenging to say the least , it is a place of 'Shadows and Light'. It is open to the public but this is no ordinary air show. You should arrive before dawn ready for at least a 2½ to hour trek and a climb of 2,700 feet (823m). For aviation enthusiasts it is an experience unlike any other, the flying is sensational, the snowy mountain backdrop is awe-inspiring. 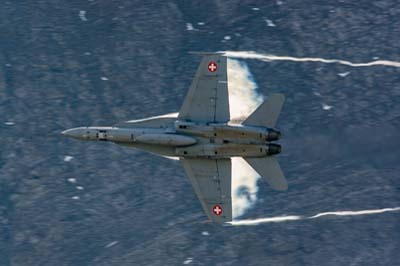 You will see Swiss Air Force McDonnell-Douglas F/A-18C/D Hornets and Northrop F-5E Tiger IIs firing live rounds from all four points of the compass some virtually over your head. In short bursts from nose mounted cannon they fire at pairs of 20 foot (6m) wide orange cloth targets. 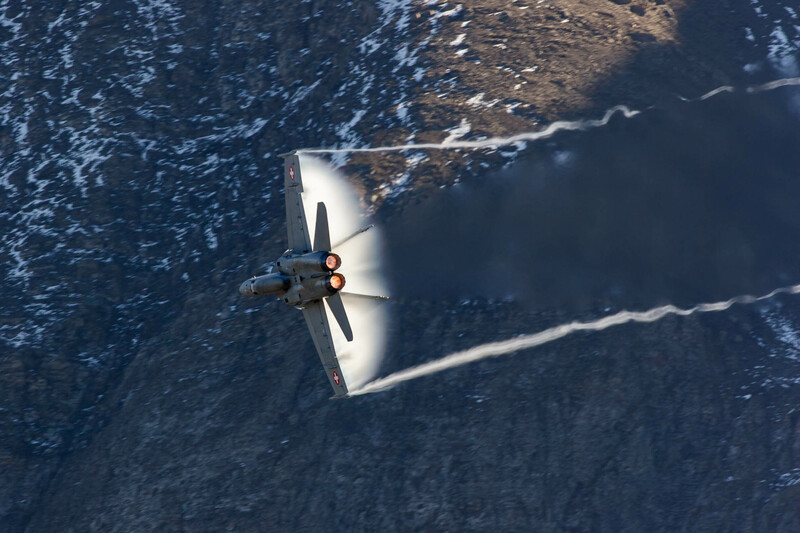 The fast jets fly up and down the narrow valley and when flying across the narrow valley towards a shear mountainside, they pull up into a steep climb and pass inverted over the mountain peak, this is truly breath taking. 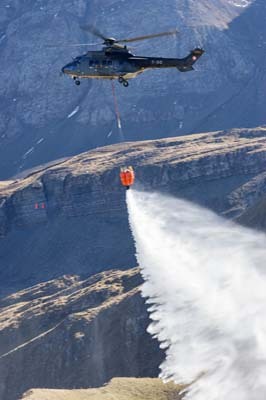 Its not just fast jets flying fast and as low as 250 feet (76m) with numerous high-G turns, the Swiss Air Force helicopters are also called in to action to demonstrate mountain rescues and fire-fighting techniques with an aerial water drop. Past displays have been opened with a Eurocopter AS.532 Cougar demonstrating its missile Self Protection System (ISSYS) by spectacularly ejecting 128 flares. 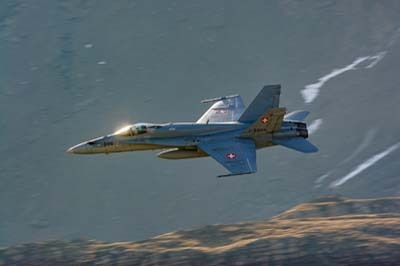 More recently the demonstration commenced with a pair of Hornets flying up the valley while firing off self-protection flares. 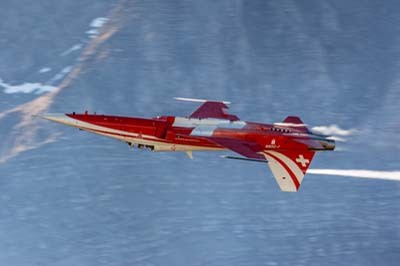 The finale should be a 20-minute display by the Patrouille Suisse in their distinctive red and white Tiger II’s. Flying in tight formations and trailing white and blue smoke somehow they seem more at home here in the Swiss Alps performing in front of a picture postcard backdrop, the Swiss Alps. The demonstration itself will start at 14:00 but my advice is to be in position at the summit by 08:30. From this time helicopters start ferrying VIPs and supplies to the control centre and the mid morning a practice can produce some of the best flying of the day. 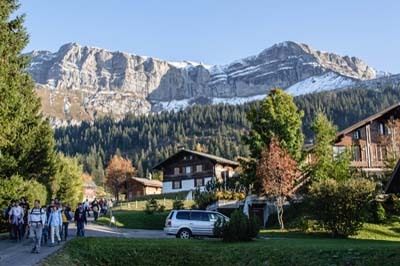 The latest procedure, it was changed in 2010, is to make your way south from Brienz towards Axalp village, you will be directed to a car park just short of the where the long narrow winding road climbs up towards Axalp village. From 06:00 a shuttle bus service from this car park will ferry everyone to the village, last year the return cost was 40 Swiss francs (around £28) the show is free. A chair-lift can take you part way up the slopes perhaps saving you an hour of hiking however you could queue for longer than this, especially when you are all coming down at the end of the day. So avoid the wait and get the most of the experience by doing the whole climb. Don’t worry, you are given a small map of the area at the start of the ascent and marker flags line the path. You could also join up with a group who know the way. There is a much easier way up to the range! 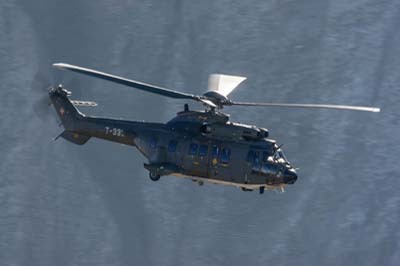 Flying from nearby Meiringen air base, 300 VIPs and 30 accredited journalists are ferried up by helicopter each day. This is done after the morning's flying has ended, at 11:00 a.m., by around six Puma/Cougar helicopters. The journey taking a mere six minutes. You must be properly prepared if you are to enjoy the experience. The climb is arduous but manageable by reasonably fit people. The oldest person I’ve met at the top was 76. 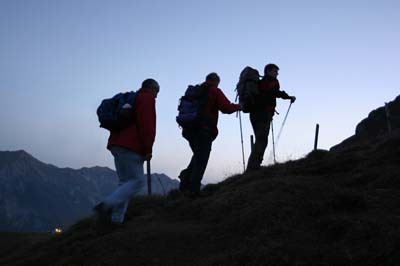 Proper walking boots are essential, many use a hiking stick and take a flashlight or better still buy a head-mounted light. Pack your gear into a rucksack. Assume the temperatures are going to be below freezing with a stiff wind, so warm clothes are very, very necessary. Remember this is the high Alps the weather can change very quickly. You will need water for the hike and sunscreen for when the sun comes up. Food and drink is airlifted to the top for sale to the spectators. F/A-18C Hornet (J-5010) in a high G turn on full re-heat generating spectacular vapour effects in the cold air. Three views of the Ebenfluh control tower on Axalphorn. Left to right: Looking across from 'Tschingel'; from the Puma landing spot and from the helicopter's cockpit when on approach. 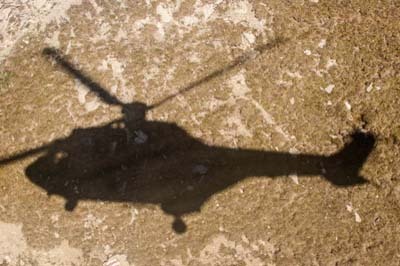 Just shadow, a Cougar is about to touch down. 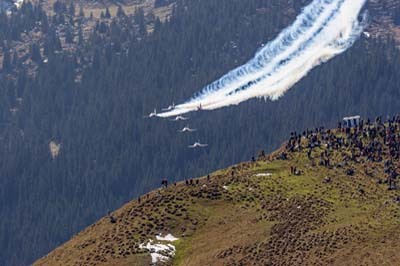 Left to right: Most of the spectators gather on 'Tschingel', shot taken from the control tower area; the Patrouille Suisse sweep low past 'Brau' from the west, on their way up the valley past 'Tschingel' and the control tower. 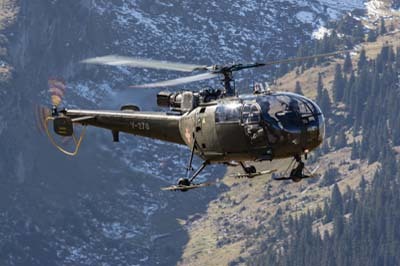 Finally an SA.316B Alouette III approaches the second landing area between the control tower and 'Tschingel', the background shows the preferred alternate route back to Axalp, down the valley from Axalphorn. 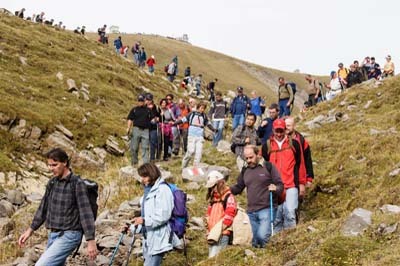 The final image shows one of the routes taken by many of the spectators back down from the range at the end of the demonstration. Serious photographers will take a range of lenses from a wide angle for scenic shots, to a mid range zoom for formation flying shots with at least a 300mm telephoto lens for the main action. The shooting conditions are challenging as you are facing towards the south and the sun most of the time. In front of you is a much higher Axalphorn peak and its snow covered slopes are permanently in shadow. Particularly in the morning the aircraft fly through the shadows, once out of it they are backlit. With a background of snow it is very difficult to judge the right exposure and retain some detail in the snow. I tend to reduce the exposure by around one stop. On cloudless days, the shadows and snow have a blue colour cast. There are three basic locations for photography. The closest to the flying is by the control tower at the top of the valley. To get there for the mornings flying, you need to be in position by 8:30 a.m. From this time the path across to the tower is roped off till lunchtime for safety reasons. 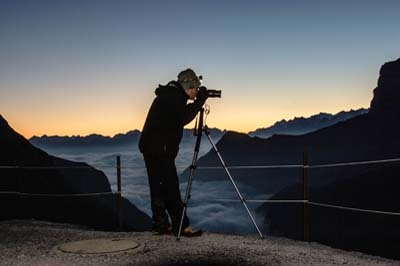 If you don’t make this deadline, then it is not a problem, a morning spent at the second location known as ‘Tschingel’ at 7,362 feet (2,244m) is fine. This location is a little further back from the control tower and slightly lower down the valley. The photography from here offers some different angles and lighting conditions. A third location is known as ‘Brau’ at 6,400 feet (1,950m), which is further down the valley. This location is much lower and therefore an easier climb than the other two areas. At this location only some of the aircraft pass close enough for a full-frame shot. 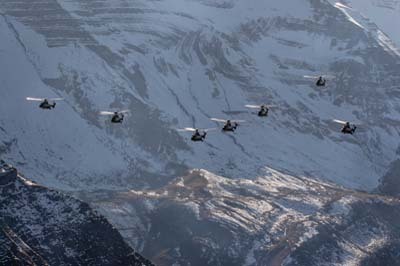 In 2003 the flying on the two scheduled display days, was cancelled due to bad weather and the risk of avalanches, this was repeated in 2011. In other years low cloud has swept up the valley curtailing the flying prematurely. However the two days before the event are used for flying practice, so for the fit and really keen additional climbs on these days should be considered. On the practice days cars may be allowed up to Axalp village but parking is limited. 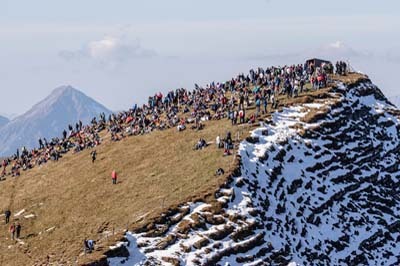 If you are sensible and take all necessary precautions you will be one of 2,000 or 3,000 people young an old that have an experience they will never forget by attending one of the World’s most spectacular flying events. It is not just the flying the views are stunning and on the way down in the early evening when the light is amazing you must take your time to enjoy the walk, for me this is one of the highlights of the long day. Eurocopter AS.532UL Cougar (T-340) at the end of it's display turns to face the crowd. The snow, rock face and light gives the image a black and white feel. 'Top-shots' of jets flying through the shadow of Axalp's mountains by the three jets to display at this years demonstration. Left to right: F/A-18C Hornet (J-5006) in early morning action. Left to right: Safety check, Aérospatiale SA.316B Alouette III (V-262) checks the firing range for stray walkers before live firing can begin. AS.332M-1 Super Puma (T-312) and AS.532UL Cougar (T-335) in the early morning sun. 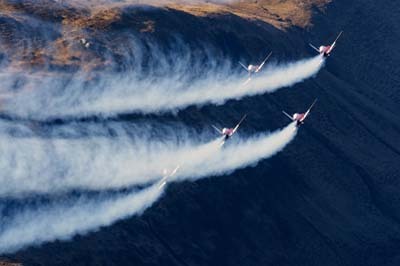 The Patrouille Suisse's with their six F-5Es close the show each day adding smoke in the valley to produce more unusual lighting effects. Both the F-5E and F/A-18C employ a 20mm cannon to fire at two types of ground erected targets. 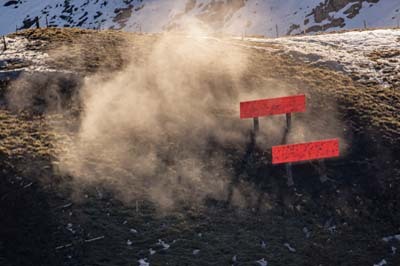 Firstly there are pairs 20 foot (6m) wide orange Day-Glo cloth targets on the mountainside facing up and down the valley. A second type of target employed is a pair of 6 feet (2m) square orange metal panels which are bolted to the rock. The nearest pair of targets are erected just 750 feet (230m) away from the crowd line. Left to right Two west facing 20 foot (6m) wide orange cloth targets (left) were erected for each days flying. The dust and numerous holes were a result of several passes from the F-5E Tiger IIs and F/A-18C Hornets firing from their nose mounted cannon. 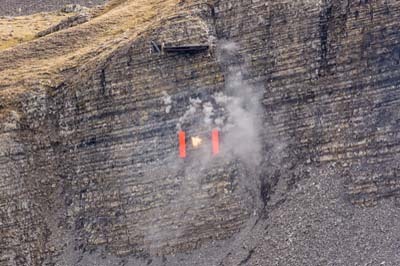 Sparks fly up from around the orange metal panels which are bolted to the mountainside, as the ammunition ricochets off the surrounding rock. Northrop F-5E Tiger II (J-3068) firing from its two nose mounted Colt-Browning 20mm M39 cannon. 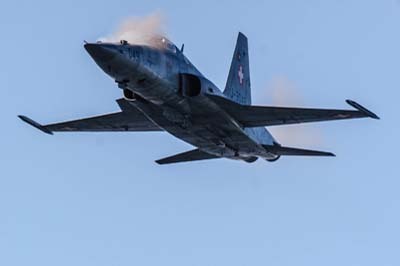 The F-5E was firing between two groups of spectators at targets that were no more than 250 yards (230m) away from the crowd line. 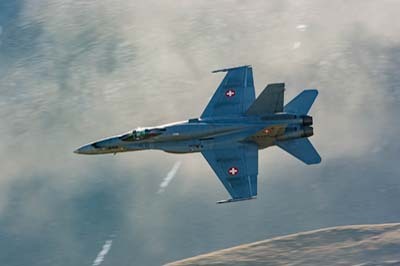 F/A-18C Hornet (J-5014), descending at a 10º angle of attack, to fire in bursts of 240 rounds at the target. Left to right: The view from Axalp village of the Ebenfluh firing range. AS.532UL Cougar (T-341) is about to touch down at the range beside the control tower to collect it's VIP passengers. 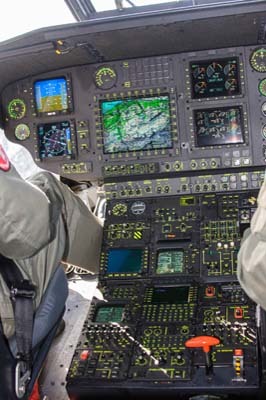 Cockpit view of AS.532UL Cougar (T-341) showing the moving map display, Axalp in the centre. The fleet of Super Pumas and Cougars return at the end of the show for the mass evacuation from the summit of 330 VIPs and accredited media. During World War II Switzerland's neutrality was threatened with frequent border violations as Swiss, German and Allied aircraft were all involved in aerial combat over Swiss territory. Alpine airfields were constructed, notably at Turtman (closed December 2003) and Meiringen, where caverns were carved into the mountains to house it's military aircraft. During this period, in 1942 and 1943, the Ebenfluh firing range was put in to service. 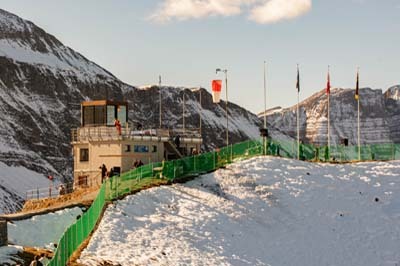 To this day, the range is in regular use for the training of pilots in low-level flying in a mountain environment and for live firing of ammunition at ground erected targets. The Ebenfluh range is in operation from October 1 till April 30, with a break over Christmas. 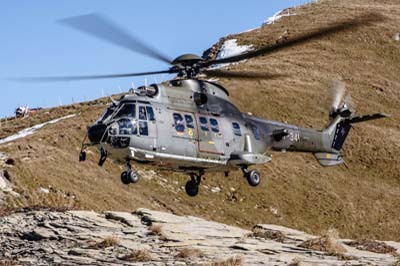 The event has been held in October for many years with the exception of 2004, when the Swiss Air Force wanted to commemorate their 90th anniversary in style. 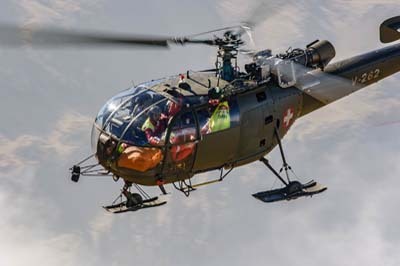 The resulting 'Air 04' air show at Payerne, attracted 275,000 people and 150 aircraft from eleven countries a similar show is planned for 2014 and Axalp will be postponed for a year.